culminated with one of the best days ever. I feel like jumping on a bed myself!!! bet you want to go jump on a bed now too! Just saw the slideshow, what BEAUTIFUL pictures! Your creativity with the outfits, the bed, etc. is amazing! The pictures are beautiful! I love the dresses the girls have on and your outfit too. Wow. That is all I can say! 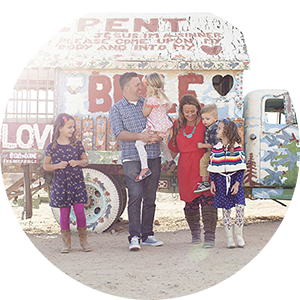 You sure did put a lot of love and creativity behind your family pictures! Can't wait to see them. Gorgeous! You look amazing girl! 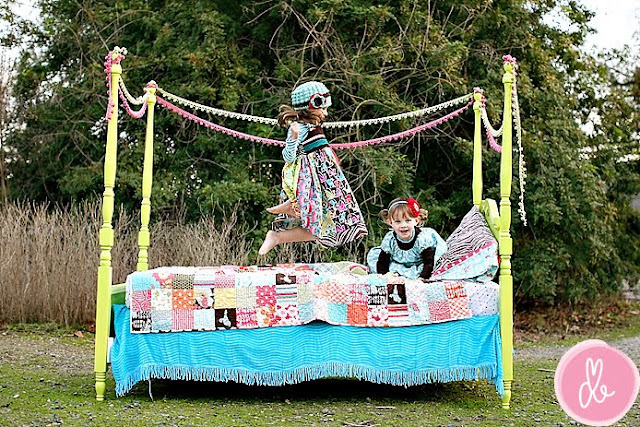 I love the bed, the dresses, the headbands, the quilt on the bed... ALL.OF.IT! I saw the pictures on her blog and was blown away by how beautiful they are! I love everything about them - what a gorgeous family you have and I adore the outfits and accessories, and that bed! :-) you are too creative and absolutely beautiful! Oh WOW! That picture is so great! I can't wait to see the rest. That picture is so fantastic!! I love all of it. Oh my gosh... just checked out the slideshow... so super darn cute!! Love it! and all your crafty stuff, all I can say is WOW! I just got back from Drew B. 's site and I'm speechless. Your photos are so amazing I forgot how to think. Your eyes are piercingly beautiful in that first? shot of just you and Jason. fabulous julie you are a lucky lucky girl!!! These are absolutely precious. Everything about it fits perfectly! The dresses. The bed. The quilt!!! Love it. I wish you lived in Seattle. I want to be your new best friend. OMG those are BEAUTIFUL pictures!! You have a GORGEOUS family! I LOVE the bed shots the best - how totally original! Wow - I just can't get over those pictures - just stunning! the slideshow is amazing. just amazing! what a loving & beautiful family! I can't even get over how in love I am with all of the pictures! I am incredibly jealous. Your slideshow from Drew is simply stunning and so heartfelt. Beautiful! Oh what great pictures! Love the colors you chose for all of you to wear. Beautiful family! Absolutely beautiful! Fantastic job! What a beautiful family you have! Seriously! Those are STUNNING! The pic of you and your husband is so beautiful. And your girls? Breathtaking! Will you post tutorials for the dresses? just went to drew's blog .. pictures are amazing!!!! LOVE the girl's outfits!!! AND THE JOY PILLOW!!!! what a great touch!!! i absolutly love how joy is always there!!!! did you make the girl's outfits can you tell us who did? also the fabrics you used were great ... can you share with us? Oh. my. goodness. Those are amazing! Seriously. I'm speechless. Oh my word fabulous!!! Now, that does look like fun. And I can only imagine how fabulous the pictures are going to be!!! You're killing me. Post more!!! Too cute Julie, every aspect of the whole shoot is PERFECT!!! I am especially in love with the outfits!! You are so creative! WOW! Amazing photos! And I am so jealous, the outfits were beyond perfect! Where did you get the pattern for Halley's dress?! I can't find any place to buy it online. Love your pictures. And I love reading your blog. I love the outfits and the pictures. Just found you blog a couple of weeks and love it. I grabbed your button.